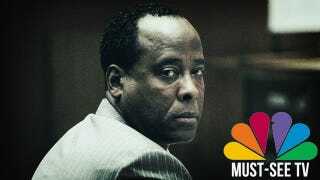 Did NBC Inadvertently Fund Conrad Murray's Legal Defense? When he started working for Michael Jackson — and even when the pop icon died — Dr. Conrad Murray was in debt. He was behind on child support payments, owed money to credit card companies and medical equipment suppliers, and was described as being "cash-strapped." Yet at his trial — during which he did not take the stand — Dr. Murray was represented by an "expansive" legal team. Where did the money come from? And did you know that NBC is airing an exclusive interview with the doctor tomorrow, in conjunction with a documentary by a British production company? A documentary the network paid for? In January of this year, when Dr. Conrad Murray was ordered to stand trial in the death of Michael Jackson, his medical license in the state of California was suspended. Yet somehow the doctor has managed to retain a team of lawyers. Though he never took the stand, Dr. Murray has spoken about his relationship with MJ in network interviews. But the documentary purchased by NBC features behind-the-scenes footage before and during the trial. According to Harriet Ryan and James Rainey of the Los Angeles Times, representatives of Michael Jackson's estate have demanded that NBC cancel the program. "We would like to know how much money in total was paid for this privileged 'access,' " estate co-executors John Branca and John McClain wrote in a letter Wednesday to executives at NBC, MSNBC and its parent company, Comcast. "It doesn't matter to us if it was a production company, Comcast, NBC Universal or MSNBC that paid for access to Dr. Murray because all are morally culpable." The interview, by Savannah Guthrie, took place before the guilty verdict. "Today" obtained the interview in part because its parent company, NBCUniversal, licensed a documentary about Dr. Murray from a British production company. Such arrangements are unusual, but not unprecedented. Checkbook journalism! Sometimes it seems rather innocuous. When celebrities negotiate deals for baby and wedding photos, the reader gets a nice, close look a the star's life without weird blurry helicopter paparazzi stalking. But when there's a possibly criminal element to the story, a cash exchange becomes more distasteful. Remember the mom who allegedly injected Botox into her daughter's face? She admitted that she lied, because the paper was paying $200. Last year, it was revealed that ABC paid $200,000 to Casey Anthony to "license" her personal pictures and videos — which meant that the network was funding her defense team. Good news: Sheena Upton is taking parenting classes. As far as the Dr. Murray interview and documentary are concerned, the LA Times spoke with Van Gordon Sauter, president of CBS News in the 1980s. He believes that NBC's payment to the production company effectively paved the way for the exclusive interview with Murray, a practice frowned on by most mainstream news organizations. "I don't know how you can look at that and not come to the conclusion that they were paying for the interview… This doesn't strike me as something that's appropriate. MSNBC is spending a lot of time talking [in promotions] about 'Leaning forward,' and I think this is tripping backward." NBC's official statement reads, "In connection with the documentary, NBCUniversal had the opportunity to conduct a promotional interview with Dr. Murray… Neither Dr. Murray nor his legal defense were compensated in any way." In a letter to MSNBC, La Toya Jackson writes, "I feel it morally reprehensible to cloak a murderer and convicted felon with celebrity status… I find it equally disgusting to permit this criminal to profit from homicidal acts that left my family without a brother, my niece and nephews without a father, my parents without a son and deprived the world of an irreplaceable artist… I sincerely implore MSNBC from airing this program. As for the documentary filmmakers, they claim that Dr. Murray was paid $1 for his participation. One dollar. But as mentioned in the LA Times, "Left unaddressed, though, were questions about whether the doctor received a portion of fees paid by television outlets in Britain, Australia and at least 10 other countries that will air the program."